When we took delivery of our first long-term Volvo XC40 last year, it had already started to make its mark on the popular segment, and that progress has only gained momentum since. This year, Volvo expects to sell 150,000 XC40s worldwide, double that of 2018, thanks to its first full year of sales and the increased production capacity at its Ghent factory. So it’s no surprise that this is considered a massively important car for Volvo. The fact the BMW X1 and Audi Q3 laid their stakes long before Volvo did has become insignificant. For many, including me, the XC40 is the most appealing of the three. That already gives a large clue to how my six-month sojourn with the XC40 went. But let me start from the beginning. We kicked off with a T4, the penultimate most powerful engine, in R-Design Pro with an awful lot of extras, all amounting to £41,620. Comparing like-for-like as best as possible, it worked out a few hundred quid more expensive than the Q3. The XC40 was an instant home from home, becoming an incredibly comfortable companion on short and long journeys. The plush seats – something Volvo is renowned for and I fondly remember from my 2009 C30 – were a delight and, as winter arrived, so was their heated function and the Quickclear windscreen. The most useful ‘pack’ was the £1600 Xenium because it featured the 360deg parking camera. When you live on a tight London street with high kerbs, it makes life much easier. Another important pack was the £1500 Intellisafe Pro. It features most of Volvo’s semi-autonomous driving systems, including Pilot Assist (up to 80mph), adaptive cruise control, Blind Spot Information System and Cross Traffic Alert. Adaptive cruise control remains the most usable, and maybe that’s because it has been around for a while, so I’m used to it. I tried Pilot Assist on many motorways and dual carriageways and always with success. The biggest issue is that giving up control is distracting, for now at least. By closely watching the car steer itself round a bend on a motorway while feeling unsettled that the car isn’t quite where I’d have placed it, even if it’s perfectly fine, means I’m unintentionally paying less attention to other factors on the road, namely other drivers’ behaviour. While we’re talking tech, I quickly warmed to Volvo’s On Call system, a subscription service that includes an app that lets you control the car remotely. There were some hiccups. On an early try, the car’s alarm went off less than a minute after I’d started the car remotely, something I was able to solve quickly because I was only five metres from the car. But after that, all went smoothly, and when we had a cold snap, I routinely turned the XC40 on for 10 minutes before I got in, meaning the windows had already defrosted. It’s incredibly efficient, and for anyone who appreciates that, totally worth it. After a few months with the T4, I switched to a D3, the entry-level diesel, in mid-range Momentum Pro (from £32,420) with more or less the same extras as before. In between, I had a fortnight in a T3, the midrange petrol. My favourite was the T3, which had sufficient power and refinement to make the T4 not worth the extra expense. The D3 wasn’t quite so admirable: the auto ’box and engine didn’t work so effortlessly together, which meant low-down, unnecessary revs between second and third gear. It wasn’t bad, but by comparison, the weakest of the three. The pay-off, of course, was better fuel economy. Quite a few colleagues noted that the T4 wasn’t very wallet-friendly, but we gave it back when it hit 3000 miles, which could have been the turning point for better figures. In the D3, we averaged 41.4mpg – still not hugely impressive for a mid-range diesel. Inside, other than the aforementioned comfort, the XC40 is a neatly designed, practical space. Ours comfortably fitted children and/or adults in the back and the boot was always big enough (and on a par with the Q3’s). It took a little while to get used to the good-looking infotainment system and I still maintain, six months on, that digital temperature controls are a massive pain in the bum. I haven’t spoken much here about what the XC40 is like to drive. Suffice to say, it’s pleasing and handles handsomely. It’s everything you’d expect and more from a compact SUV. That means it’s in line with, if not better than, rivals such as the Q3. I was sad to see the XC40 go and still miss it now, which is probably all you need to know about how much I like this car. SUVs have plenty going against them to be pleasing dynamic propositions (size, height, weight), particularly over the hatches on which they’re generally based. Yet the XC40 gives you all the things you’d buy an SUV for (and does those better than most), while displaying surprising grip levels with how it handles. On that last point in particular, Volvo has succeeded where so many have failed. CLEAN SWEEP XC40 has the most effective windscreen wipers that I can recall in a modern car. FELT DOOR LINING Different as well as made from recycled plastic bottles. What’s not to love? OVERALL COMFORT This car always felt welcoming, even on the cold, dark mornings of a British winter. 360° PARKING CAMERA The saviour of house owners in London not rich enough to have a driveway. BLIND SPOT WARNING LIGHTS So overactive they made me doubt if a vehicle’s there, even though I’d checked the old-fashioned way! Since an early blip with Volvo’s OnCall app in which the alarm went off after I’d remotely started the car, it’s been smooth sailing. I’ve got used to turning on the XC40 10 minutes before getting into it on frosty mornings. When I lose my parked car on the busy streets around my house, the app can activate the XC40’s flashing lights or, if I’m having a really bad day, sound the alarm. With only a few weeks left before the XC40 departs, I’ve been racking up some miles on the weekends to discover whether this impressive car can grow on me further or, perhaps, do quite the opposite. I’ve been to Brighton (too windy for pictures), to Bedfordshire (too distracted by my nephew for pictures) and to deepest, darkest Surrey (pictures herein). It’s a couple of months in with the entry-level D3 diesel and my view hasn’t changed since I first wrote about it: it’s not as good as the petrol T4 I ran previously or the petrol T3 that I borrowed for a couple of weeks. But by all means and purposes, it’s fine. There’s enough power delivery for it to cope comfortably on motorways and it’s only really changing from second to third gear that reminds you the engine and auto ’box should work better together. But for space and comfort, it feels like all the car you’d ever need. This has become an effortless car for all journeys, always cosseting you in comfort while being nimble and compact enough to suit a country road or a narrow London street. On a recent trip to rural Surrey, I visited a family member who has a rather admirable car collection. On display was a VW Golf R, a VW California plus a 993-series Porsche 911 Carrera and a 1974 Carrera MFI. I’d been lying if I said the XC40 would be my first choice among that lot – but, as part of the collection, the XC40 genuinely has a place. The Golf R is pretty practical for an everyday car, but the Volvo has the edge, as by far the most comfortable, easiest way to get around from that pool of metal. A point proven by the willingness of Stan, a very picky dog, to jump into the boot. While I’m well used to day-to-day life with the XC40, a new feature has just been activated on our car: Volvo OnCall. This is a subscription-based service with a downloadable app. It shows information on your car – fuel range, temperature outside the car, whether it’s locked – and allows you to control certain things. One frosty morning, I tested it by turning the XC40 on via the app (it remains locked) so the car would defrost before I got in. Within 20 seconds, the alarm went off. I got a notification on my phone telling me as much, but I’m not sure what would have happened if I wasn’t able to instantly point my key in the direction of the car to stop it. Soon after, I tried again, and it worked perfectly. I’ll be playing with OnCall more over the next couple of weeks and will report back. Warm Reception Getting into an already warmed-up car thanks to OnCall is brilliant on a cold morning. Bum deal Is it too much to ask for a heated steering wheel as well as heated seats, please? One member of my household (not me) has finally got a smartphone advanced enough to test the wireless charging function in the XC40. It’s a bit hit and miss: often it says ‘clear debris’ when there’s no debris to clear, and it’s not as fast to charge as via a wire. Nonetheless, it’s an effortless way of charging on the move. If you think that our longterm XC40 is looking distinctively different, you’d be right. Our time is up with the red T4 AWD R-Design Pro, the top-trim XC40 and second most expensive petrol in the range, with prices starting from £35,250. 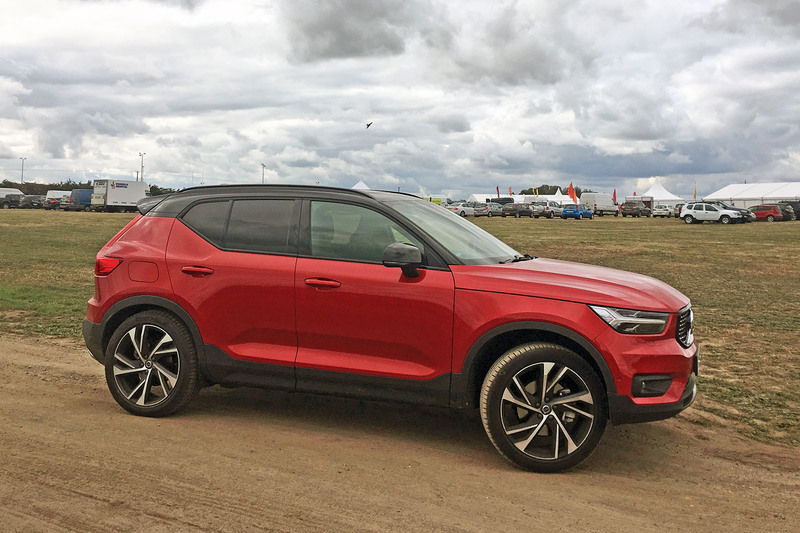 In its place is an XC40 at the other end of the spectrum, the D3 Momentum Pro – one trim level up from the bottom – with front-wheel drive and a 2.0-litre diesel engine. This one starts from £30,300 but with automatic transmission, like ours, costs £31,850. It has plenty of extras, as did our T4, so the gap is about the same when you look at the final price as tested: £42,320 for the T4 and £38,845 for the D3. So what’s featured on the D3? The Convenience pack (£350), which includes a plug socket in the centre console and a flexible boot floor, Intellisafe Pro (£1500), which encompasses most of the semi-autonomous driving systems, and the Xenium pack (£1600). That includes a panoramic sunroof and all the fancy parking stuff – a 360° camera and Park Assist. Plus some more single options, such as the power-operated tailgate (£375) and smartphone integration (£300). Despite having far less exterior kit on the Momentum Pro than the R-Design Pro, the XC40 is still, in my opinion, a really good-looking car. That’s no doubt helped by the Ice White pack, a £700 option that gives the car a white roof, white door mirrors and 19in white alloy wheels. I can’t say I’d ever opt for white wheels, but I’m really won over by it on this specification. Along with the grey body colour, it seems quirky but understated and has grown on me. Inside, the car isn’t much different, either – except there are beige plastics on the lower section of the dashboard and matching felt in the doors, rather than grey. My observation is that it’s less modern and less likeable, but my dad thinks it looks more premium than the grey equivalent. Each to their own. It’s not surprising that the T4 engine is more enjoyable. It’s more powerful, more linear and faster. The T4 XC40, with its 187bhp, 221lb ft 2.0-litre petrol unit, achieves 0-62mph in 8.5sec. The D3 version is decent, covering the same benchmark sprint in 9.9sec with its 148bhp, 236lb ft 2.0-litre diesel. The biggest criticism, other than it being slightly gruff for a modern diesel, is that it doesn’t integrate as well with the auto ’box as the T4, failing to respond quickly enough to necessary gearchanges and revving out as a result. I’m getting used to it, but it isn’t as effortless as I’d expect for an otherwise well executed car. One area where it’s excelling over the T4 is fuel consumption. The T4’s economy was probably the biggest concern as it never achieved more than 30mpg on average against a promised 40.4mpg. That said, the switch to the diesel occurred at just over 3000 miles, which is the point where we might have started to see the biggest gains, having run in the car. The D3 has 5111 miles on the clock and is delivering 40.1mpg – better for my bank account, but still far off the official 56.5mpg. Other than that, it’s more of the same for the XC40. It’s an enjoyable, comfortable place to be, easily fitting in the ridiculous amount of stuff I take home to my parents every year for the Christmas period. Two children’s car seats are easy to fit and the panoramic sunroof brings a brief respite of silence from my cheery 17-month-old nephew. APPEARANCE Grey paint plus white roof, mirrors and alloy wheels – a £700 option – look great. POWERTRAIN D3 diesel engine isn’t as refined or well paired to the automatic gearbox as I’d expect. Our XC40 T4 R-Design Pro AWD auto costs £42,320, including options worth £5800. Recently, I tried a front-drive T3 R-Design manual with no extras, at £30,160, which has 154bhp to the T4’s 197bhp. Upshot: I’d buy the T3. Good engine, good steering, good ride. I’d only go for a few extras: Xenium pack (£1600); powered tailgate (£375); Winter pack (£500); keyless drive (£350). Our long-term XC40 is fitted with all of Volvo’s semi-autonomous driving systems, creating a perfect showcase for the many years of development Volvo has undertaken in the self-driving sphere. Its early investment has paid off, with the company securing trial deals for fully autonomous XC90s with firms such as Uber. One early Sunday morning, I decided to test the systems to their full extent on a drive from London to the country via some motorway. With few cars on the road, it felt like a good opportunity to try these features. Full Propilot on the XC40 is easily activated on the steering wheel, and when it’s in play, a green steering wheel appears in the instrument cluster. That means it can accelerate, brake, keep in lane and steer in lane all by itself. On motorways, it’s faultless, although if you’re in the fast lane close to a hard concrete barrier, it can be nerve-wracking. I think the XC40 sometimes places itself a little bit further to one side of the lane than I would – which isn’t wrong but is disconcerting. It’s likely only a centimetre or two, but when you’re ceding control, it can feel a lot. If you take your hand off the wheel, the car makes a sound to remind you to put your hands back on. So on motorways, it’s fine. Dual carriageways? Also fine. Normal B-roads? Not fine. Which is to be expected because these systems aren’t yet designed for those roads. With a clearly marked lane on only one side of the car, it went into panic mode. There was quite a lot of drifting (not the back-end kind) before the car wisely decided that it would stop the semi-autonomous system running altogether. There are plenty of other systems, but I’ll focus on two. I see the argument for both of them and am pleased they exist but find them frustrating to deal with. One is Cross-Traffic Assist. Example: I reverse out of my nan’s drive slowly. I can see a car coming from my left and I’ve anticipated that in the very slow speed in which I’m reversing. But the car doesn’t know, so it brakes abruptly, alarming me unnecessarily. I get a similar reaction from the emergency braking function. I know there is a small island ahead of me in the middle of the road and already plan to move around it, but the car doesn’t know so it makes loud sounds and sometimes brakes. It’s easy to criticise such systems – which have the same annoyances on all cars that offer them – but this is the price of progress. Ultimately, they will make our roads a safer place. EASY LIFE ON MOTORWAYS Propilot making motorway driving easier. GIVE IT A BREAK, BRAKES Over-keen braking system not allowing me to drive. I was filling up the XC40 recently, when a man in an XC60 parked at the pump behind me. Out of the corner of my eye, I saw him nod and smile at me. It was fellow Volvo camaraderie! The love-in continued when we passed each other in the shop. Him: “Nice new Volvo!” Me: “We have great taste!” Isn’t it great when our enthusiasm for a car or car maker brings good cheer? Following our observation that the XC40’s mpg wasn’t great, a reader made contact to agree. His Volvo dealer told him “fuel consumption will be rubbish for the first 3000 miles”. Based on that, we’re optimistic we’ll see improvements. So far, the mpg is excellent on the open road and particularly poor in towns. Overall, our current consumption is 28.9mpg. It has been an easy first few weeks with our XC40 long-term test car. It has been carrier to many friends and family, all of whom have greeted it in exactly the same way: with praise. All have been interested in the car – what’s it like, what does it rival, how they’ve always liked Volvos. Me too, I say. My theory is that awareness of Volvos is still rising and the good but different looks of the XC40 help it stand out from the crowded crowd. An old friend’s partner, who drives a Toyota Hilux, tells me he likes Volvos for their lack of ostentatiousness and how he has fond memories of an XC90 rented some years back. Anyway, back to the car at hand. So far, it has done plenty of trips around the M25 and up the M1 to my home, the home counties, proving itself to be an excellent motorway cruiser. There is absolutely nothing of note on these journeys except how comfortable and peaceful it is. There was a trip to the Shuttleworth Collection, a celebration of heritage planes but also cars, reminding us of the wonders of vehicle engineering over more than a century, helping us to progress to today – and cars as impressive as the XC40. My partner and I took custody of my niece and nephew for an afternoon, perfectly demonstrating the family friendliness of the car. Two child seats went in easily, both in terms of fitting and size, and my three-year-old niece (“I’m four in November,” we heard a lot) approved of the car. Now that she’s noticed that aunty regularly turns up in a number of different cars, she’s a harsh critic. Still, she was easily won over by the panoramic sunroof, and even more so when we let her control it briefly. The other weekend jaunt in the Volvo was to Thame Food Festival, full of chutney, fudge and deliciously fattening food. It was also the first chance I’ve had to take my all-wheel-drive XC40 off road. Admittedly, it was some very dry but bumpy grass, so that didn’t push its limits, but it held its own well, with far less juddering than plenty of its two-wheel-drive rivals on uneven ground. It feels too premium and pretty to want to push the limits with it off road – which is why I predict almost no owners will use it in such a way – but still, it’s nice to know it’s there. It’s particularly comforting when thinking about the winter months ahead and my journeys to my parents on non-gritted hilly country lanes. The only negative comment I’ve had so far concerns the price. When family and friends ask how much the car costs and I say “around 40 grand”, their response is “well, it should be bloody nice!”. There’s no like-for-like rival in the Audi Q3 line-up but its range-topping model, the 2.0 TFSI 180PS Black Edition quattro, costs £36,945. Volvo’s ultimate range-topper – one up from ours – is the D5, which in this trim costs £37,320. The point is the Volvo might be a tad more expensive than other premium compact SUVs, but not enough to be a major negative factor in buying decisions. BROAD APPEAL Getting lots of good attention from friends. IRRITATING DRIVER TECH Some of its driving assistance systems are deeply annoying. The XC40’s interior materials might not seem that interesting. But honestly, they are worthy of note. The industrial felt in the doors and around the footwell not only looks cool and original, but is also made from recycled plastic bottles. I like the ridged floor mats too. They’re understated, smart and different from the boring equivalents. Reader, a disclaimer: I’m a Volvo fan. I love its cars for not being ostentatiously German yet still premium, I love them for having a bit of cool Swedishness about them and I love them for their comfort. I sold my 2009 C30 a few years ago, and still regret it. I’m not alone, though. Volvo has undergone a resurgence in recent years, with an incredibly fresh model line-up (the oldest model, the V40, is five years old and will be replaced next year). Testament to this is last year’s sales figures: Volvo sold 571,577 cars worldwide, an increase of 7% on the previous year. By comparison, Jaguar sold 178,601. In the SUV sector, the XC90 and XC60 have already done wonders in their respective segments, but last year came arguably the most important of them all: the XC40. This compact SUV brings some welcome fresh blood into a hugely competitive segment: it vies with the Mercedes-Benz GLA, BMW X1, Audi Q3, Range Rover Evoque and a plethora of cheaper but very good rivals, such as the Seat Ateca and Nissan Qashqai. So far, the XC40 has certainly proved its worth. It sold 5610 units in Europe in July, more than the XC60 and more than double its rival, the Evoque – which is reason enough for Autocar to see whether the hype is justified by having one on our fleet for the next six months. Looks are always subjective but, personally, I reckon Volvo has nailed the XC40. It manages to appear different from the XC90 and XC60 while still having a commonality and, crucially, it stands out from all the other compact SUVs on the road. Its British designer, Ian Kettle, has since been poached by Tesla, showing that it has been well received not only by buyers but the industry too. We’ve gone for the middle-of-the-range petrol engine, the four-cylinder 2.0-litre producing 187bhp and called T4, in range-topping R-Design Pro trim. The T4 comes only with all-wheel drive and an automatic eight-speed transmission, although, of course, plenty of the variants are available with front-wheel drive and a manual ’box. For now, the entry-level D3 diesel remains the biggest seller in the UK, but Volvo expects it to swing towards petrol in the not too distant future. Our XC40 achieves 0-62mph in a respectable 8.5sec. The fastest variant, the T5, shaves 2.0sec off that and the slowest is the D3 AWD with automatic gearbox at 10.4sec. Our car costs £35,820. We have plenty of options, but even the most basic XC40 has a good specification. This includes navigation, a 9.0in centre console touchscreen, rear parking sensors, LED headlights with active high beam, cruise control and hill-start assist. Volvo prides itself on leading on car safety (earlier this year, research found that there had never been any passenger or driver fatalities from car-on-car collisions in an XC90 in the UK since 2004, when records started) and so it includes three safety systems as standard. These are City Safety, which can detect pedestrians, cyclists and large animals, and front collision warning with fully automatic emergency braking; Oncoming Lane Mitigation, which automatically provides steering assistance if you drift out of your lane; and Run-off Road Protection, which tightens the front seatbelts if the car leaves the road and front seat frames with a collapsible section to reduce vertical forces and help prevent spinal injuries, says Volvo. Our option list is extensive but most notable in terms of extra cost are two packs. The first, the £1500 Intellisafe Pro, gives you more safety tech, such as rear collision mitigation and cross traffic alert, as well as auto-folding door mirrors. The second, the £1600 Xenium pack, brings the panoramic sunroof, 360deg parking camera and automatic parallel and 90deg parking. First impressions? As I’d hoped and expected: the XC40 is instantly comfortable. Comfortable on long and short journeys, with a cosy, enclosing interior that I expect will treat me well over the winter months. It’s perfect around town and surprisingly nifty getting into small spaces on narrow roads with parallel parking. I haven’t pushed our XC40 on the handling front yet, but that’s not its goal. Instead, the car offers light if not wholly precise steering perfect for urban driving. The R-Design Pro is a harder ride than some of the lesser trims but it is still acceptable over the endless speed bumps on my commute. I have two minor gripes so far. The notch gearstick takes some getting used to. Presumably, it has been used to keep the feature as compact as possible, but even after a couple of weeks with the car, I sometimes have to check in the driver display that I’m in reverse, not drive, or vice versa. The other thing is fuel economy. Official combined economy so far is 40.4mpg. We have got it to a best of 28mpg so will be watching it closely as we run the car in to see if or when that figure improves. ""Volvo fan" not that it's important but the V40 actually went on sale over 6 years old not 5. £36k is a lot but then this is the top of the range plus extras, also its a petrol turbo automatic 4x4 suv, so running in at 28mpg doesn't sound too bad, especially if its an urban commute that the author is doing (speed bumps etc) its certainly no more expensive than equivalent audi, bmw, merc, jlr etc. Personally I dont buy into premium as I really dont see justifiable difference in paying for a premium badge. Though I was always a volvo fan, but that was from the 850 back. "£36k is a lot but then this is the top of the range plus extras" with extras (some of which I'd expect on a top of the range) it's £41.5k. Sorry, I put diesel earlier when I meant petrol. In which case I'd expect it to be a bit quicker too! Not sure about performance, as it's not the top spec engine, middle I think was said, so high spec with middle engine, just like a low powered q3 in expensive s-line trim, I agreed that it is expensive but aren't all the so called premium competitors as well? The nearest VW Tiguan equivalent is the R-Line Tech, which is not as well equipped, and the only petrol variant is a 1.5 2wd with 150bhp, and starts at £33.150.. So is the XC40 really that expensive compared to its competition? The equivalent Audi Q3 is the Sport 40 quatro with an OTR price of £35.170, and again is not as well equppped, and is considerably more if you try and match the spec..
Leaving aside side by side comparasions (I belive the R-Libe Tech comes with full sunroof). I'd expect a £33k 1.5 car to come with a reversing camera (£375), front paking sensors (£325), and would you believe Vovlo charge you £300 for Android and Apple connectivety, and £85 for rear power locks (so much for Volvo Safety) . As to £1100 for towbar!! !